This past week I was convinced a mischievous ghost was haunting my house. Weird things were happening. It was subtle at first; so much so that I hardly noticed it at first but one morning, at around 6 am, I realized something was out of place when I opened my eyes. There was no giant dog with his head on my bed, breathing moist warm dog breath right into my face in an effort to wake me up. In fact, there was no giant dog anywhere in my bedroom. I called Abbott's name a few times and waiting to hear the familiar clicking of his paws across our floor but the only thing I heard was the chirping of the birds from outside my bedroom window and the soft whirr of our ceiling fan. Worried, I got up to look for Abbott, hoping one of the kids had locked him in their bedrooms with him over night and that he hadn't been dog napped in the dead of the night when I noticed something out on our deck. Weird. I didn't recall waking up and letting my dog out in the middle of the night but maybe one of the kids did. I didn't give it any more thought as I crawled back into bed with my big puppy. Except the same thing happened the next morning. I kept waking up to realize my dog is not in my face and finding him outside on the deck. 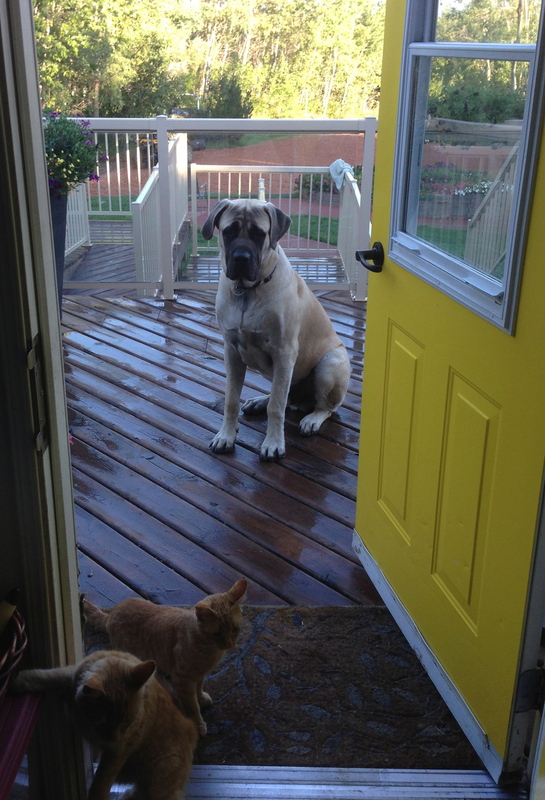 The kids claimed they weren't letting him out and I know I certainly wasn't, so WHO LET THE DOG OUT? After a week of waking up and finding my dog randomly outside on my front deck, I was starting to freak out. The idea of someone opening up my front door, luring my giant dog outside and then rooting through my underwear drawer (I have no evidence of that actually happening, but my imagination is ACTIVE) I was starting to lose sleep. It was the look of a guilty hound if I ever saw one. He knew what was going on, but the damn dog just wasn't going to tell me. I thought about setting up a sting, to bust the intruder but that seemed like a lot of not sleeping and well, that seemed like work. I thought about asking the kids to set up a sting but they're already talking about having me committed to an institution of some sort and well, why give them more reason? I thought about having an exorcism performed but when I mentioned it to my husband he just laughed and told me to stop watching scary movies. I went to bed that night determined to catch the criminal/ghost who was messing with my dog. The next morning I woke up to Abbott breathing in my face and pressing his nose into mine. He was in the house! For the next few days, all was right with my world. Abbott was exactly where he was supposed to be in the mornings. Everything was back to normal. Until I started seeing my dog outside in the middle of the day, when he was supposed to be inside, with me. The only people who are home in the days are Knox and myself and neither of us is letting the dog out. So who is letting the dog out? My front door was wide open. Immediately, I looked around for the dog. He was on his dog bed, his ears cocked, and he was looking at me with an "I don't know" look. "Damn gremlins," I mumbled as I shut the door. I walked into the kitchen, wondering if I really was losing my mind and busied myself with unloading the dishwasher. A click. The click my door handle makes when it's opened. I stood there for a few seconds and worried about ghosts when it dawned on me. My dog is taller than the door handle. Abbott learned how to open the front door. I needed proof though, so I put the dog back in the house and then I stood on the deck, calling his name. And just like that, my dog was using his paw to open the front door, like it was no big deal. All those mornings I found him on the front deck with the door closed? His big arse must have pushed the door shut. He can open it from inside the house, but he can't pull the door open from the outside. It's one way only dog magic up here. I'm spending the day baby proofing my front door today because my dog is an escape artist. I guess I should be grateful I'm not insane. At least not yet. Between the dog and the teens, surely I'm well on my way. *Psst: Have you commented on this post? Go save a life and help the Shot At Life campaign succeed. Go be someone's superhero today.